1998— Just over 20 years ago, scientists exploring the mid-ocean ridge system first made the spectacular discovery of black smokers—hydrothermal chimneys made of metal sulfide minerals that vigorously discharge hot, dark, particulate-laden fluids into the ocean. The ultimate source of the fluid venting from these smokers is seawater, but a comparison of chemical compositions shows that seawater and hydrothermal fluid are distinctly different. The vent fluids are not only far hotter than surrounding seawater, they are also more acidic and enriched with metals, and have much higher concentrations of dissolved gases, such as hydrogen, methane, and hydrogen sulfide (see table below right). The metals transported by the fluids frequently form ore deposits at the seafloor, and the dissolved gases support a prolific biological community that derives its energy from chemical reactions rather than sunlight. By what processes is seawater turned into this remarkable fluid that emanates from black smokers? The answer lies beneath the seafloor, within the oceanic crust. The mid-ocean ridge system, which forms where the earth’s tectonic plates are spreading apart, is volcanically active and the site of numerous heat sources, which induce seawater to circulate through the permeable oceanic crust. It is estimated that the equivalent of an entire ocean’s worth of water circulates through the mid-ocean ridge hydrothermal systems every 10 million years or so. As the seawater percolates through subseafloor rocks, a complex series of physical and chemical reactions between seawater and volcanic rocks drastically changes the chemical composition of both the seawater and the rocks. These chemical reactions not only influence the composition of the oceanic crust, they also play a role in regulating the chemistry of the oceans. 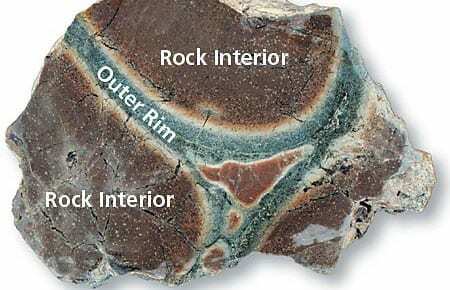 The history of these chemical reactions is recorded in the minerals and chemical composition of the rocks. By investigating samples of rocks that have been altered, we can learn about the sequence of water-rock interactions taking place in the subsurface. We can then begin to understand the processes responsible for the chemical composition of vent fluids, the formation of sulfide-rich mineral deposits, and the existence of biological communities at hydrothermal vents. Gaining access to investigate the subsurface portion of a hydrothermal system is, of course, a difficult problem, and scientists must employ several different strategies. The most direct approach is to find techniques to collect and analyze altered rocks. One way is to drill a borehole through a seafloor hydrothermal mineral deposit and recover samples from the oceanic crust beneath. Over the past few years, the international Ocean Drilling Program (ODP) has conducted drilling operations in two hydrothermal areas—one on the Juan de Fuca Ridge off the northwestern US coast, and one on the Mid-Atlantic Ridge about halfway between Florida and West Africa. The drill cores recovered from these sites allow scientists to study the variability in rock-water reactions that occur under the different physical and chemical conditions found at different depths within the earth’s crust. Ocean drilling operations, however, are extremely expensive and consequently have been carried out at only a few locations. Scientists can also collect seafloor rock samples by using dredges and small submarines (“submersibles”) in areas where faults and fractures have exposed rocks on the seafloor that were once in the deep subsurface. The disadvantage of this method is that the same processes that expose the rocks may also muddle the spatial and temporal relationships among individual samples. Nevertheless, much has been learned about the chemical effects of water-rock reactions from dredge and submersible samples. 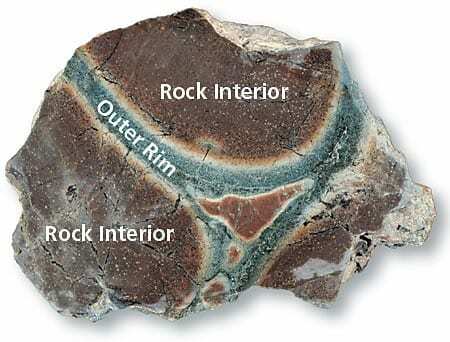 In many samples, the outer rim, which has been altered by exposure to circulating hydrothermal fluids, can be compared to the fresh, unaltered interior of the rock in order to learn how the rock has been changed by the fluid (see rock below). While drilling, dredging, and submersibles can be used to collect rocks to study the shallower portion of the ocean crust, scientists have had to turn to rocks on land to investigate deeper sections of the hydrothermal system. In a few locations, including sites in the western US, Oman, Cyprus, and the west coast of Newfoundland, sequences of rocks exposed on land resemble what scientists believe to be the structure of the oceanic crust. Many geologists think that these rocks represent sections of oceanic crust that have been thrust onto the continents by tectonic movements. Within these so-called “ophiolite” sequences are ancient analogs of seafloor hydrothermal mineral deposits, and these sites provide another source of hydrothermally altered rocks for study. But this method, too, has pitfalls: In some cases, ophiolite rocks have been altered during the tectonic processes that uplifted and thrust the oceanic crust onto land. This subsequent alteration often obscures the original alteration that took place on the seafloor, making it difficult to use the rocks to study submarine hydrothermal processes. Scientists also employ experimental strategies in laboratories to understand fluid-rock interactions, setting up reactions between rocks and seawater under conditions simulating those in a seafloor hydrothermal system. The earliest of these experiments actually pre-dated the discovery of seafloor hydrothermal systems. In the experiments, crushed rock samples and seawater in varying proportions are placed in a sealed reaction vessel (commonly referred to as a “bomb”! ), which is then subjected to high temperatures and pressures. These “cook-and-look” experiments provide a way to explore how reactions change as physical and chemical conditions are varied, and they help scientists determine how the chemistry of the fluid and the rock evolves as the reactions proceed. Over the years, experimentation has progressed to include “flow-through” models that examine the changes in chemistry and physical state as fluids migrate through a system. While laboratory simulations often result in end-products that are somewhat different from those observed in rock samples from actual altered ocean crust, scientists have gained insights that have been critical in deciphering the complex set of water-rock reactions taking place in natural hydrothermal systems. A third approach to understanding the chemistry of hydrothermal systems is geochemical modeling. Scientists have used models to investigate the sequence of minerals that dissolve and precipitate during fluid-rock reactions, as well as to examine how the fluid changes its composition as it circulates through the crust. These efforts depend on the availability of good thermodynamic data at the temperatures and pressures that occur in hydrothermal vent systems, much of which has been generated only in the past few years. The models provide a framework for integrating the observations made from rock samples and experimental studies, and they have proven to be a powerful tool to relate the changes in fluid chemistry to the alteration mineralogy of the rocks. •An upflow zone, where the buoyant hydrothermal fluids rise and are discharged at the seafloor. Seawater percolates readily into the upper layer of the oceanic crust, which is constructed of highly porous and permeable volcanic rocks that are broken apart in many places by cooling cracks and tectonic fractures. As a consequence, reactions between seawater and the exposed rocks at relatively low temperatures up to about 60°C are pervasive. Although reactions are relatively slow at these low temperatures, they nevertheless begin to change the composition of the seawater through two processes. First, the seawater partially oxidizes the crust, resulting in the removal of oxygen from the seawater. Minerals containing iron in the rocks are replaced by iron oxides and hydroxides (a process analogous to the formation of rust), which also fill veins and pore spaces in the upper crust. Second, the reactions with seawater break down the original rock minerals, replacing them with alteration minerals such as mica and clay. In the process, potassium and other alkali elements, such as rubidium and cesium, are transferred from seawater into the rocks. Beyond about 300 meters into the oceanic crust, penetration of seawater becomes more and more restricted as the rocks’ permeability decreases. Larger fractures and fissures are more likely to become the main conduits for fluid flow. As the fluid (already oxygen- and alkali-depleted relative to seawater) continues to penetrate downward toward the heat sources, it becomes heated further, and other reactions occur. At temperatures above about 150°C, clay minerals and chlorite precipitate out of the fluid, essentially removing all of the magnesium originally present in the fluid. The formation of clay minerals and chlorite also removes hydroxyl ions from the fluid, resulting in an increase in acidity (that is, a lower pH). This increase in acidity, in conjunction with the breakdown of the original minerals in the rocks, causes calcium, sodium, potassium, and other elements to be leached from the rock into the fluid. Hence, the removal of potassium (and the other alkalis) from the fluid at lower temperatures is partially reversed at higher temperatures at greater depths! Another important reaction results in the formation of the mineral anhydrite (calcium sulfate). This mineral possesses something called “retrograde solubility,” which means that instead of becoming more soluble with increasing temperature as most minerals do, it becomes less soluble. At the pressures found at the bottom of the ocean, this results in anhydrite precipitating from seawater when temperatures rise above about 150°C. This process removes about two-thirds of the sulfate initially present in the seawater and also limits the calcium concentration of the fluid. At temperatures greater than 250°C, the remaining sulfate in the fluid reacts with iron in the crust to form metal sulfide minerals. The “reaction zone” designates the region where high-temperature, water-rock reactions occur. This zone is near the heat source that drives the circulation system. The depth of the reaction zone depends on the depth of the heat source and varies from one mid-ocean ridge to another. On the fast-spreading East Pacific Rise, the presence of a magma lens at a depth between 1.5 and 2.4 kilometers defines the lower limit of circulation, but seawater may penetrate deeper on slower-spreading ridges where no melt lens has been detected. Scientists think reactions in this zone determine the final chemical characteristics of the hydrothermal fluid. Reactions at such high temperatures (up to 350° to 400°C) produce a characteristic suite of alteration minerals (chlorite, sodium-rich feldspar, amphibole, epidote, and quartz), which, in turn, controls the fluid composition. Metals, such as copper, iron, and zinc, as well as sulfur, are leached from the rock by the acidic fluid. This provides the source of metals for the massive sulfide deposits observed at the seafloor, as well as the hydrogen sulfide to support the chemosynthetically based hydrothermal biological community. Buoyancy forces cause the hot fluids to rise rapidly toward the seafloor, much as hot air causes a balloon to rise in the atmosphere. Initially, the upflow is focused along a conduit of high permeability, such as a fault surface. As it reaches shallow depths, the flow may continue to be focused and may discharge through a chimney, or it may follow more tortuous pathways and be discharged as a more diffuse flow (like water flowing through a sponge). Continued high-temperature reactions between the rock and the upward-flowing, metal-rich, magnesium-depleted hydrothermal fluid produce an “alteration pipe” of highly altered rocks with an interconnected network of veins filled with sulfides, silica, and chlorites. As focused high-temperature (350° to 400°C) fluids discharge at the seafloor as black smokers, mixing with the surrounding seawater causes metal sulfides to precipitate and form massive sulfide deposits rich in iron, copper, and zinc (see article, page 22). However, at locations where the volcanic pile is especially permeable, the upflowing hydrothermal fluid will mix with colder seawater in the shallow subsurface, resulting in the metal sulfides being precipitated beneath, rather than at, the seafloor. The resulting lower-temperature fluids, depleted of metal sulfides, vent as “white smokers,” rather than particulate-laden black smokers. Shallow subsurface mixing may also heat seawater to form anhydrite and cool hydrothermal fluids to precipitate silica, both of which cement the metal sulfides or seal fluid conduits. Together, all the hydrothermal water-rock reactions that occur—from the time seawater enters the system to the time hydrothermal fluid leaves it—play a role in regulating the chemistry of seawater. But the relative importance of hydrothermal reactions must be balanced with other factors that influence ocean chemistry—particularly, rivers, which are the principal conduits by which most (but not all) chemical elements enter the ocean. River input provides a good measuring stick by which to compare the relative contribution of hydrothermal activity to the fluxes of elements in and out of the ocean. Hydrothermal vents are a source to the ocean of alkali elements that leach from the crust during hydrothermal alteration (although this process may be tempered somewhat by lower-temperature weathering of the shallow crust away from the ridges, which removes alkali elements from seawater).Vents also represent a significant source of manganese input to the ocean. Most of the metals present in hydrothermal fluids (iron, copper, zinc, etc.) are removed rapidly by precipitation, either at the seafloor or by mixing with seawater in the subsurface, so most of the metals do not enter the oceans. On the other hand, hydrothermal circulation removes magnesium and sulfate from seawater, so the crust acts as a sink for these elements. The magnesium loss is perhaps the most significant, and hydrothermal activity may be a major mechanism of balancing the magnesium budget in the ocean. Susan Humphris’s research is supported by the National Science Foundation. Thomas McCollom is an NSF Earth Sciences Postdoctoral Fellow. Susan Humphris first came to Woods Hole from England in 1972 to enter the MIT/WHOI Joint Program. For her Ph.D. thesis, she studied some rocks dredged from the ocean floor that had reacted with seawater and determined the reactions that must have occurred. Six months after she completed this work in 1976, the first hydrothermal vents were discovered. She has spent more than three years of her life on research vessels of various kinds, ranging from traditional sailing ships, when she worked at the Sea Education Association teaching oceanography to undergraduates, to drilling vessels as a participant in the Ocean Drilling Program. She has completed about 30 dives in submersibles and has used ROV Jason to study new hydrothermal sites. In her spare time, Humphris and her husband tend a large vegetable garden and raise chickens and the occasional pig. Tom McCollom’s interests are in the organobiogeochemistry of seafloor hydrothermal systems. He manages to squeeze in a little research now and then between running around on the soccer and ultimate fields, pedaling his bicycle, climbing up (or skiing down) hills, dancing to his favorite bands, and birdwatching with his wife, Ifer. A rock sample,recovered by drilling 116 meters below the active seafloor hydrothermal vent site at 26°N on the Mid-Atlantic Ridge, shows how the rock has been altered by reactions with seawater at temperatures of about 300°C. 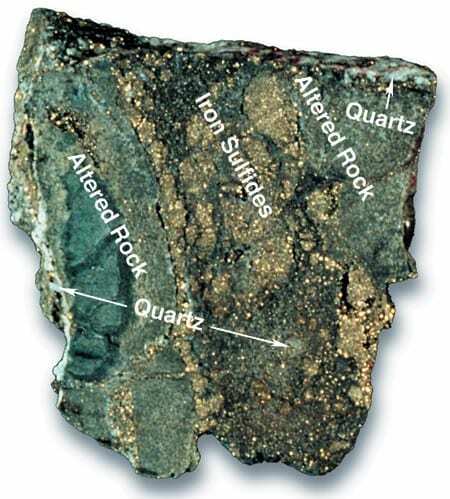 Pieces of highly altered rock (gray) are cemented together with minerals such as iron sulfides (gold-colored) and quartz (white). A comparison of characteristics and chemical composition shows the distinct differences between seawater and hydrothermal vent fluid, in this case fluid from the TAG hydrothermal site on the Mid-Atlantic Ridge at 26°N. 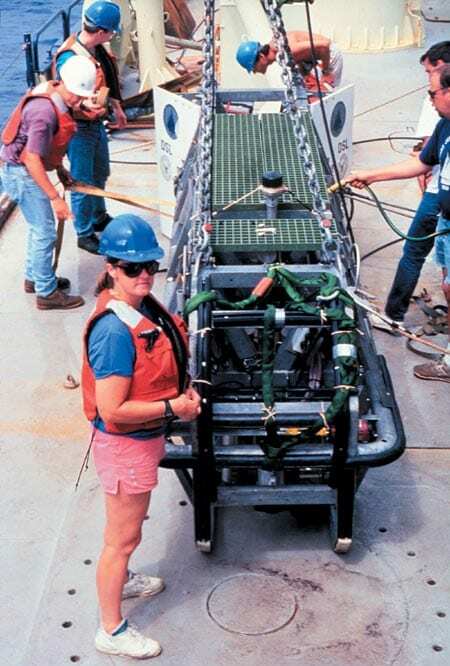 WHOI Senior Scientist Susan Humphris (foreground) prepares to deploy the near-bottom Argo II optical and imaging system operated by WHOI?s Deep Submergence Operations Group. Towed behind ships at 5 to 15 meters off the seafloor, Argo II collected video and still images of seafloor hydrothermal vent systems. In a hydrothermal circulation system, cold seawater seeps through the permeable seafloor and deeper subsurface dikes. It undergoes a series of chemical reactions with subsurface rocks at various temperatures to create hot hydrothermal fluid that eventually vents at the seafloor.